On August 2nd every MST3K fan's prayers will be answered when Shout! 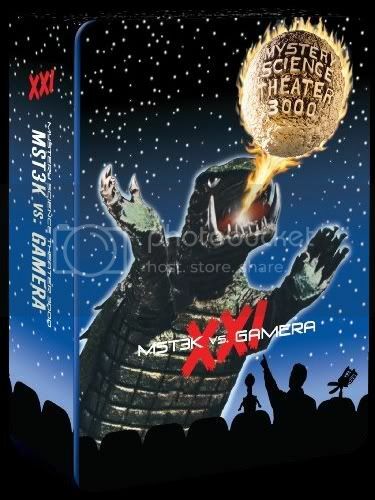 Factory delivers MST3K Vs. Gamera, Mystery Science Theater 3000, Vol. XXI. This set includes all 5 episodes featuring the Japanese monster Gamera (think Godzilla crossed with a turtle). These episodes all premiered in 1991 during the show's 3rd season and are collected here for the first time. Before this set, I had only seen the first Gamera film (review HERE) so it is fun to revisit it again with the MST3K treatment along with 4 of its sequels. The first Gamera film came out in 1965, launching a much loved franchise featuring a giant turtle monster wreaking havok in Japan. After the first film however, Gamera became a good guy, fighting off other monsters and being "a friend to children everywhere" (enter Gamera theme song here). In Gamera vs Barugon, a bunch of treasure hunters search for a giant opal which turns out to be an monster egg. Once the monster is unleashed, Gamera must come to save the world from the creature. In Gamera vs Gaos, a giant blood thirsty bat creature (Gaos) is awoken from an erupting volcano and Gamera must stop it when a group of scientists' plan fails to lure the bat with fake blood. Gamera vs. Guiron begins when some annoying kids are kidnapped by female aliens for sinister purposes. Gamera must save the kids (and the world) from a monster unleashed by the aliens. Lastly, in Gamera vs Zigra, the earth is threatened by a fish-like monster who wants revenge on our planet for ruining his home planet's water. Though the Gamera films have some charm, they are pretty terrible and prove to be easy targets for Joel Hodgson, Tom Servo and Crow. The quips come fast and furious and I found myself laughing throughout. Each of the five episodes were top notch and it is great to have them all together in this box set. Sitting through the films back to back might be a chore so I recommend watching them spread out. Also included in this set, which comes in a collectible tin case, are 5 exclusive mini posters by artist Steve Vance. The set also features a slew of bonus features including a look back at MST3K & Gamera, a documentary on Gamera by Japanese monster expert August Ragone, Gamera vs. The Chiodo Brothers (Killer Klowns from Outer Space, Pee Wee's Big Adventure), MST Hour wraps and the original Japanese trailers. I highly recommend this set for MST3K fans, monster movie fans and bad movie fans. Order it now from Shout! Factory HERE and receive a free MST3K Stress Ball and an Exclusive Postcard Pack.